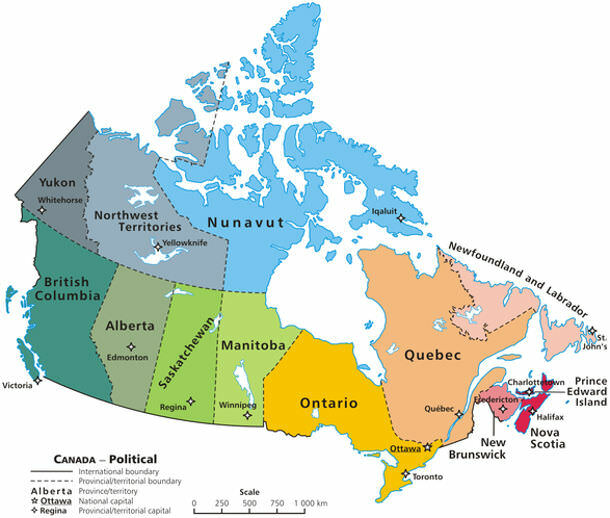 Canada is divided into 13 provinces and territories, with the three territories comprising its northernmost half. British Columbia and Alberta are often referred to as “the West”; Saskatchewan and Manitoba are called “the Prairies”; New Brunswick, Nova Scotia, Prince Edward Island, and Newfoundland are sometimes called “the Maritimes” or “the Atlantic Provinces”; while Yukon, Northwest Territories, and Nunavut are collectively called “the North Territories”. Alberta is home to some of Canada’s most spectacular national parks, each of which is overflowing with snow-capped peaks, jagged glaciers, shimmering rivers and vast lakes. In addition to natural wonders, these national parks are home to diverse wildlife, including bears, moose, deer, sheep and cougars. In the winter, Banff, Jasper and Lake Louise are ideal destinations for days spent on the slopes, and evenings spent curled up in front of a warm fire. In the summer, these national parks offer exciting cycling and hiking excursions. With a huge variety of activities to enjoy, you can count on memorable experiences, while the postcard-perfect scenery will ensure beautiful wedding photos. If you prefer a more urban environment, check out the world’s largest shopping mall in Edmonton, or soak up the bustling energy in Calgary. Whether you’re looking for untamed wilderness or a sophisticated urban experience, you’ll find it in this laid-back province. With awe-inspiring mountains, gorgeous coastlines, and vast rain forests, British Columbia offers a stunning variety of natural landscapes. The unparallel scenery in Whistler forms the perfect setting for any kind of wedding. If you’re more of a city-slicker, get married in Vancouver, a cosmopolitan city that blends styles and cuisines from around the world. Before and after the ceremony, British Columbia will keep you entertained with tranquil hot springs, scenic hiking trails, world-class skiing, excellent wineries, first-rate dining and shopping, as well as romantic beaches. The sprawling agricultural flatlands in this often-underappreciated province are the best place to truly appreciate Canada’s enormity. Hold hands while watching beluga whales from the stunning coastline, or enjoy a picnic in St. Malo Provincial Park, surrounded by oak and balsam poplar trees. Explore the diverse landscapes, which range from gleaming lakes, flourishing parklands, and pretty beaches to arctic tundra and sand dunes. Enjoy the hospitality of Manitoba’s sincere, friendly locals, who are sure to make your wedding a warm, traditional experience. Newfoundland almost feels like a completely different part of Canada, more British than Canuck with its eclectic dialects and culture. Despite its towering mountains, bountiful rivers, glacier-spotted lakes, and rugged shorelines, this province remains relatively unexplored. Newfoundland’s vast landscape is perfect for short walks or adventurous treks, while eclectic culture and folk music can be explored in its capital, St. John’s. Experience a gourmet picnic in a historic lighthouse in Ferryland, wander the winding streets of historic Brigus, or get away from it all and spend some time driving between the three pretty coastal villages: Heart’s Content, Heart’s Desire, and Heart’s Delight. With mountains kissing the skyline, immense tundra, freshwater lakes and sprawling woods, the Northwest Territories’ majestic landscapes are begging to be explored. This area offers fantastic wildlife viewing opportunities, with abundant moose, bears, caribou, white pelicans, whooping cranes and bison. Dine on arctic char, and explore rugged towns where the way of life has changed little over the past hundred years. There are ample opportunities for canoeing, kayaking, fishing, dog sledding, snowmobiling, and hiking. Witnessing the spectacular Northern Lights or the Midnight Sun will ensure that your wedding is truly unforgettable. Visit World Heritage Site Nahanni National Park to see breathtaking Virginia Falls, or escape to remote Eagle Island, nicknamed “Honeymoon Island” by the locals. Named for its resemblance to the rolling green hills and turbulent seas of Scotland, this distinctive province blends Scottish heritage with native Acadian culture. Its small villages feature sandy beaches, and fantastic hiking trails, while avant-garde music and first-class restaurants can be found in the sophisticated streets of Halifax. Imagine overlooking the ocean while you dine on fresh lobster, or tying-the-knot against the backdrop of an old lighthouse. Rent a car and take a leisurely drive along the stunning Cape Breton Cabot Trail, or get married in Lunenburg, a UNESCO World Heritage Site and one of the prettiest towns in Canada. If you’ve always wanted to get married in a wild land of icebergs and secluded wilderness, then Nunavut is the ideal location for your Arctic Wedding. As beautiful as it is challenging, this untamed province is home to fascinating local Inuit culture, unique wildlife, and exciting outdoor activities. Traversed only by aircraft, cruise ship, dog sled or snowmobile, Nunavut is a true adventurer’s dream destination. Nunavut offers some of the world’s best fishing, as well as a chance to experience the Midnight Sun, with up to 24 hrs of daylight in the summer months. Ontario showcases the best of Canada’s urban culture as well as its famous natural beauty. Excellent museums, international dining, and fantastic shopping can be found in cities like Toronto and Ottawa, while the Canadian Shield and Algonquin Park offer picturesque forests and lakes. Explore the famous wineries and heritage buildings in Niagara-on-the-Lake, or visit stunning Niagara Falls, a popular destination wedding and honeymoon site. Stroll along the shores of the Great Lakes, or ice skate hand-in-hand on the Rideau Canal. Prince Edward Island is dominated by its expansive potato fields, dotted with quaint farmhouses and sparkling bays. This picture-perfect patchwork is bordered by bright red cliffs, sand dunes, beaches, and seaside villages. PEI’s numerous heritage inns are romantic settings for wedding parties. Plan an autumn wedding and take advantage of the colours of PEI’s extra-long fall foliage period. Take a tour around the Lake of Shining Waters in a horse-drawn buggy, escape on a long coastal drive, or spend some quality time together while hiking the beautiful Confederation Trail. With its distinct European flair, there are few places in Canada more romantic than Quebec. The narrow streets, historic buildings, and chic sidewalk cafes of Montreal and Quebec City provide fantastic backdrops for a wedding ceremony. In addition to their beautiful old quarters, these cities are vibrant metropolises, home to exciting nightlife, as well as excellent dining and shopping. Like any good Canadian province, Quebec also boasts stunning natural beauty, with rolling hills, sparkling lakes, and mountain vistas found in places like the Outaouais Region, the Charlevoix Region, and the Eastern Townships. When people think of romance, Saskatchewan is not usually the first place that comes to mind, yet this prairie province has few equals when it comes to out-of-the-ways escapes, and old-fashioned hospitality. Known as the “Land of Living Skies”, the seemingly infinite wheat fields of Saskatchewan boast some of the most beautiful sunrises and sunsets in Canada. Float weightlessly in Little Manitou Lake, which has more than 13 times the salt content of the famous Dead Sea, or try fishing, hiking, biking, golfing or boating. Could there be a more romantic place to get hitched than a town called Love? This tiny village with a population of less than 100 people receives countless letters from around the world every Valentine’s Day, with senders hoping to receive the village’s signature stamp. The Yukon offers endless romantic settings for adventurous couples, with cozy cabins, inviting hot springs, and wild natural scenery. Imagine getting married under the famous Northern Lights, or against the backdrop of freshly-fallen snow. Visit incredible Kluane National Park which boasts Canada’s five tallest mountains as well as one of the world’s largest ice fields. Kick up your adrenaline with dog sledding, white water rafting, snowmobiling and horseback riding, or bond while enjoying wildlife viewing, ice fishing, canoeing, hiking or biking. 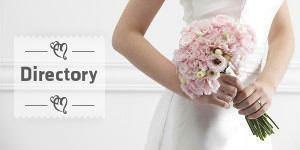 Find out more about getting married in Canada in our Canadian Wedding Guide or visit our Canadian Wedding Directory to start planning your dream wedding.